Written by: JWT Desk on October 15, 2018. The inaugural session of US-India Ministerial 2+2 Dialogue was held in New Delhi on Sep 06. Major takeaways from this dialogue were the signing of the Communications Compatibility and Security Agreement (COMCASA) and setting up of a hotline between Indian ministers of external affairs and defence with their American counterparts. A ‘2+2 dialogue’ is a term — adopted in foreign parleys — used for installation of a dialogue mechanism between two countries’ defence and external affairs ministries. To put it simply, ‘2+2 dialogue’ is an expression used to indicate that two appointed ministers from each country, the ministers of defence and external affairs in this case, will meet up to discuss the two countries’ strategic and security interests. The goal is to establish a diplomatic, yet fruitful, conversation between the two countries’ respective heads of defence and external affairs. Japan is known to draw from the format ‘2+2 dialogue’ has to offer for years now. Japan leans on this mechanism for its interactions with the US, France, Russia and Australia. India, on the other hand, has established the 2+2 dialogue primarily with Japan. 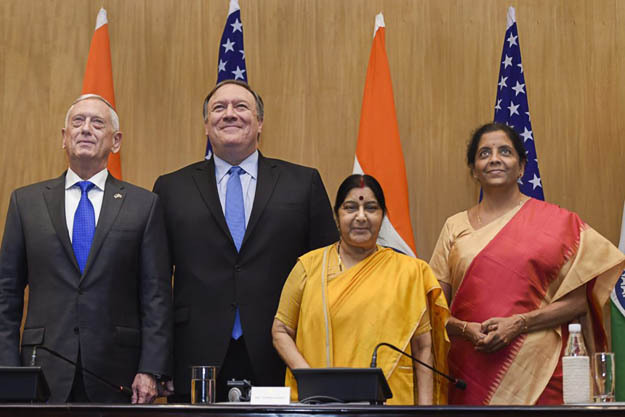 The US-India ‘2+2’ dialogue is a meeting between the India Ministers for External Affairs and Defence, and the US Secretaries of State and Defense. The two countries agreed upon holding such a dialogue during Prime Minister Narendra Modi’s visit to Washington in June last year, and it was announced after Modi’s telephonic call with President Donald Trump in August. This “2+2” dialogue is meant to replace the Strategic and Commercial Dialogue between the foreign and commerce ministers of the two countries that was held during the previous Obama administration. It is to focus on “strengthening strategic, security and defence cooperation” between the two countries. 1. COMCASA is one of the three foundational defence pacts that need to be signed by a country in order to obtain high-tech military hardware from the USA. Till now, India is a signatory on only one of the foundational agreements, called the Logistics Exchange Memorandum of Agreement (LEMOA), which was signed in 2016. Discussions have not even begun on the third agreement, Basic Exchange and Cooperation Agreement for Geo-spatial Cooperation (BECA). 2. The COMCASA agreement permits Indian military to function on high-end secured and encrypted communication equipment which are installed on American platforms obtained by Indian Armed Forces. Such platforms include C-130J, C-17, P-8I aircraft, and Apache and Chinook helicopters. This facilitates greater interoperability between forces and military hardware of the two countries, and also possibly with other countries that operate on US-origin platforms. 3. Usually, the particular agreement signed by the US is known as the Communication and Information on Security Memorandum of Agreement (CISMOA). However, the name was changed to COMCASA to signify its India-specific alterations. 4. The agreement is meant to provide a legal framework to allow transfer of encrypted communication security equipment from the US to India, which is said to be safer and more secure than the system that India uses out present. Currently, Indian military reportedly uses a locally-sourced platform to communicate between various weapons systems, which also includes the platforms that India has acquired from the US. 5. The agreement has been pending for almost a decade. One of the concerns that India originally had was that the use of such equipment could perhaps compromise on India’s own operational independence. Another worry that critics of the deal have expressed in the past is that such an agreement could jeopardise India’s established military ties with Russia and access to their weapons systems. It has also been feared that several indigenous Indian military platforms may face compatibility issues with COMCASA. This post has been seen 1788 times.